VANCOUVER, CANADA — (January 28, 2019) Moovly Media Inc. (TSX VENTURE: MVY) (OTC: MVVYF) (FRANKFURT: 0PV2) (“Moovly” or the “Company”) announces that it will not be filing its audited financial statements and management’s discussion and analysis for the fiscal year ended September 30, 2018 (the Financial Statements”) before the prescribed deadline of January 28, 2019. The Company has experienced delays in finalizing accounting records for its Belgium-based subsidiary due to an unexpected resignation of a key employee due to medical reasons. 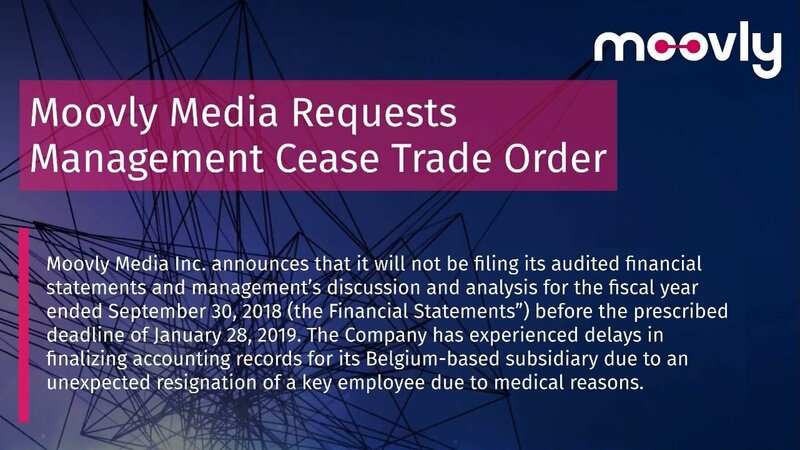 The Company has made an application to the applicable securities regulatory authorities under National Policy 12-203 requesting that a management cease trade order (“MCTO”) be imposed for the duration of the default. The Company and its auditors are working diligently to finalize the Financial Statements and expects to file the Financial Statements within the next two weeks. The Company intends to satisfy the provisions of the alternative information guidelines under National Policy 12-203 by issuing bi-weekly default status reports in the form of press releases so long as it remains in default of the filing requirements set out above. Moovly is the leading provider of creative cloud-based tools to tell marketing, communications and training stories using videos and presentations. Moovly’s advanced Studio Editor with over 175 million digital assets seamlessly integrated (via partnerships with Shutterstock & Storyblocks) is all you need to make engaging video content to promote, communicate or explain your product, service or message. Moovly’s API and BOTs technology allow 3rd parties to automate parts or all of the content-creation process, including mass customization, personalized videos (video version of mail merge), automatic content creation or updating by connecting data sources. With clients including users from >300 of the Fortune 500, small businesses, freelancers and Ivy league universities, Moovly is an intuitive, cost-effective choice for DIY creation of engaging video-based content. For additional information about Moovly, please refer to www.moovly.com.